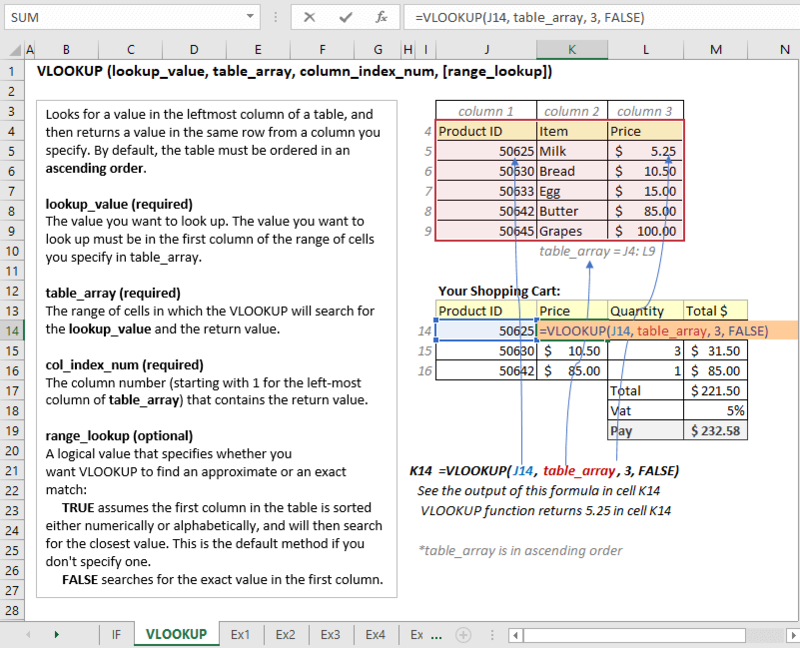 Check out the scenarios and the relevant Excel formulas. How does this array formula work? 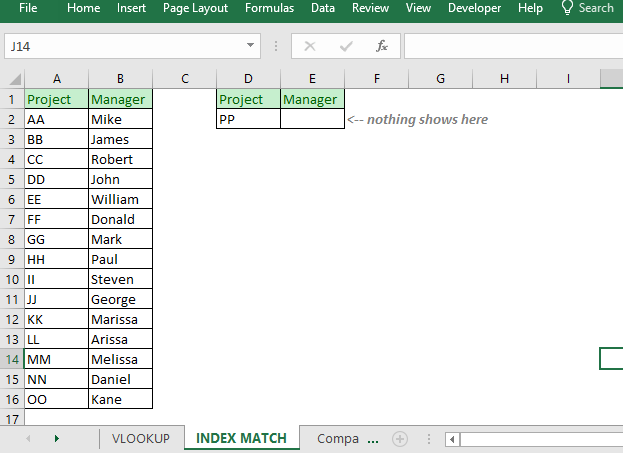 In the following spreadsheet, you are seeing a list of some Projects and their Managers. In cell D2, the Project coordinator might input a Project name and want to see who the Manager of the Project is. 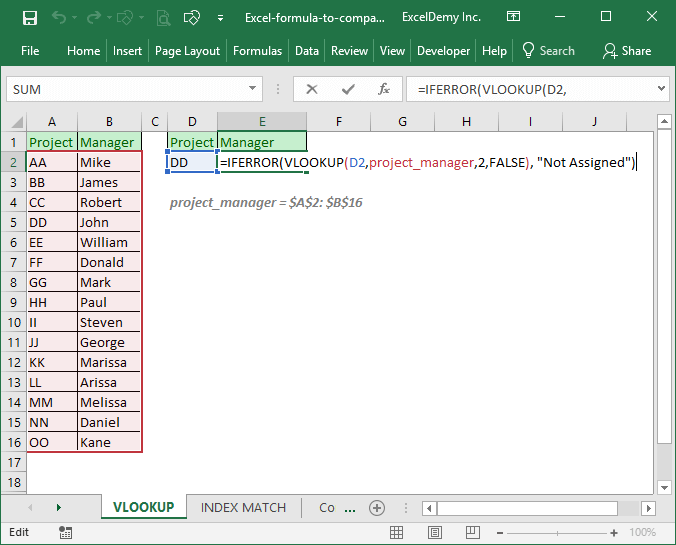 To understand this formula, you have to know the syntax of IFERROR and VLOOKUP Excel functions. Take a look at the following image. If you observe the image carefully, you will find that the formula is actually self-explanatory. This time if no matching is found, the cell will show blank as IFERROR function’s value_if_error argument is blank. 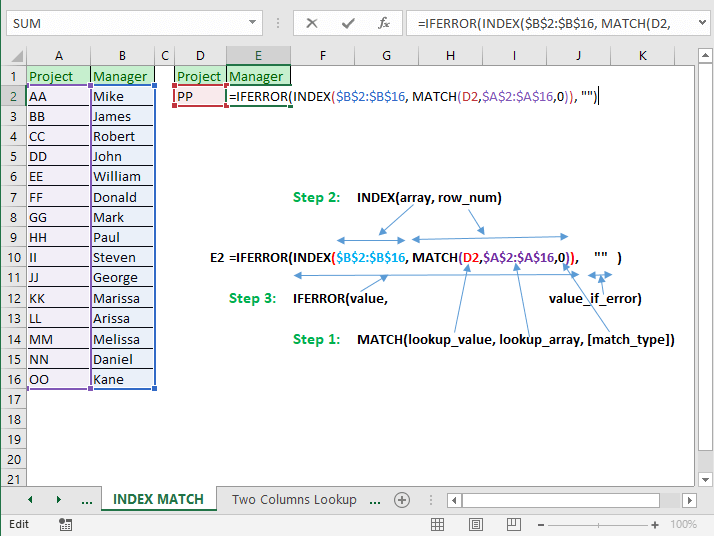 Step 1: Match function returns the relative position of lookup_value D2. Say, the value is DD. It will return 4 as DD is in 4th position in the lookup_array $A$2:$A$16. 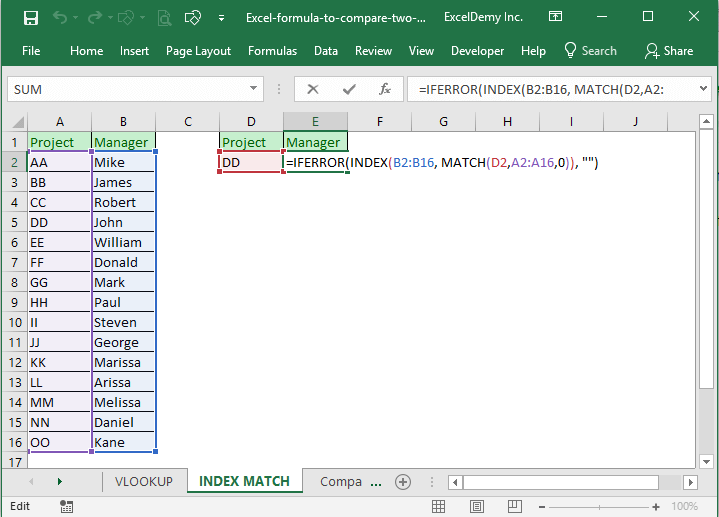 If no matching was found, MATCH function would return an error value. 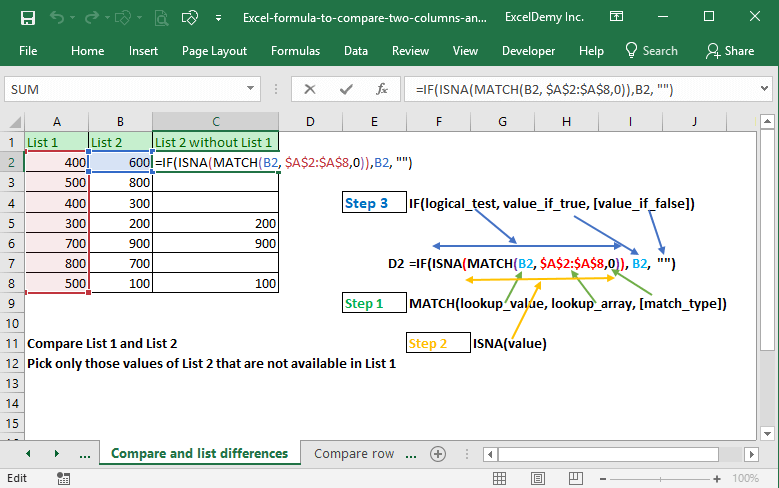 Step 2: INDEX function searches for the 4th value in the array $B$2:$B$16. And it finds value, John. So, for this example, INDEX function will return value, John. Step 3: IFERROR function finds a valid value for its value So, it will return the value. 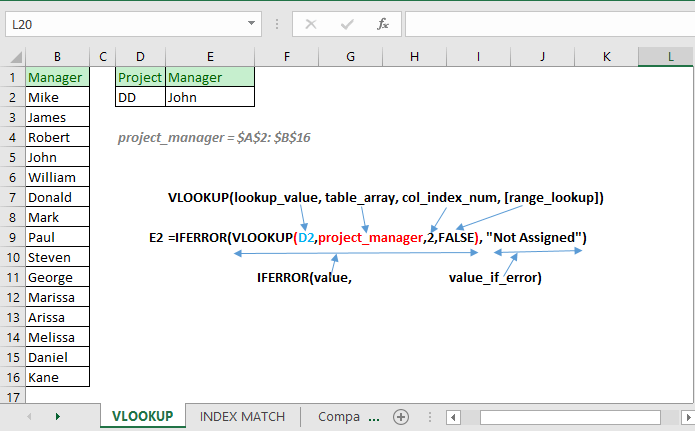 If it would find an error value, then it would return blank. I hope you got how this formula works. Always try to break down a complex formula into pieces to make it easy. This is another scenario. You have a worksheet like the following image. 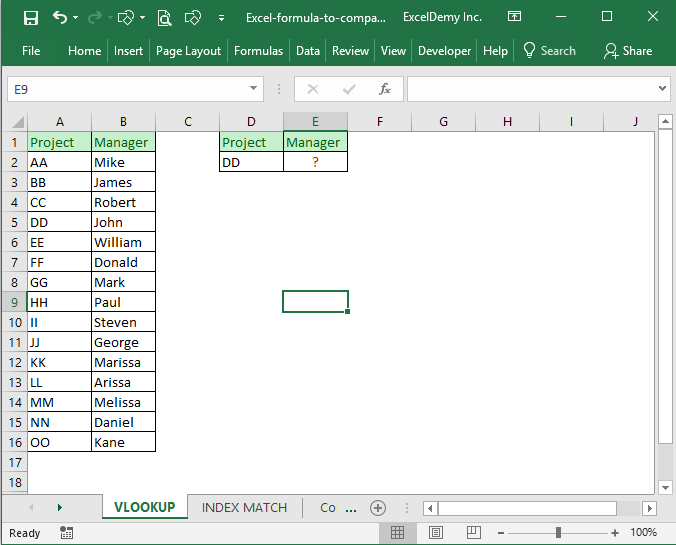 You want to conduct a lookup on the table to match two different values from two columns. 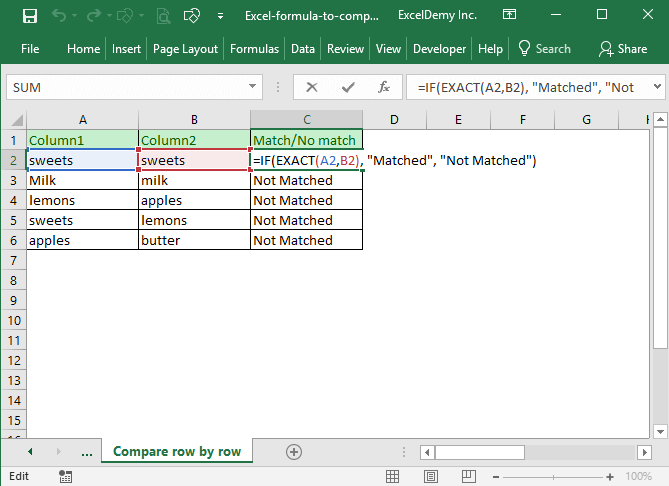 If matching is found, it will return data from the 3rd column. 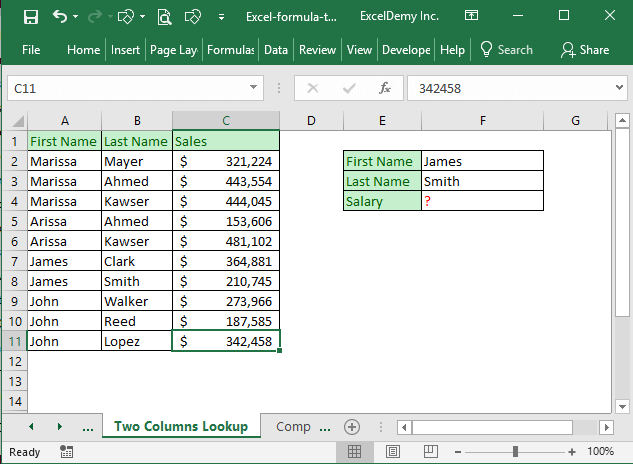 You cannot perform two columns lookup with regular Excel formulas. You have to use an Array formula. Then press CTRL + SHIFT + ENTER on your keyboard. You will get the formula is input as an array formula. At first, let’s understand the Match function part. From the above MATCH function, what will be returned? MATCH function will return 7 as JamesSmith is found at position 7 of the array. The rest is simple. In the array of C2:C11, 7th position is value 210745. So, the overall function returns 210745 in cell F4. If you fail to understand how this array formula works: check out my link. And then copy it for other cells in the column. We get the following results as shown in the figure below. You are seeing only those List 2 values are showing in the new column that are not in the List 1. When you analyze a complex formula, start with the function that does not have any other functions in it. 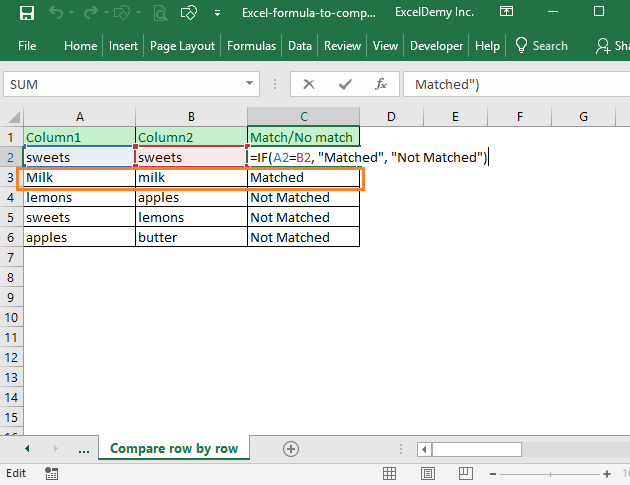 In this formula, that is the MATCH function. Match function will search for cell value B2 in the range $A$2:$A$8. If it finds a match, it will return the position of the value, otherwise, it will return the #N/A. Value 600 of cell B2 is not found anywhere in the list. So, the Match function will return the #N/A error. 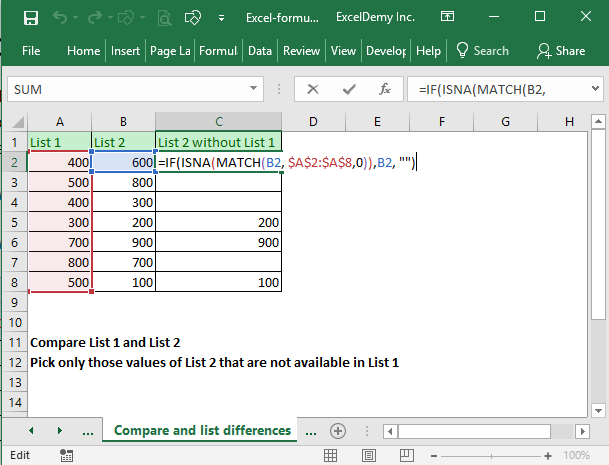 ISNA function returns TRUE if it finds the #N/A error, otherwise it will return a FALSE In this case, ISNA will return TRUE value as Match function returns #N/A error. When ISNA function returns a TRUE value, IF function’s value_if_true argument will be returned and it is B2, the value of B2 is 600. So, this formula will return 600 as value. 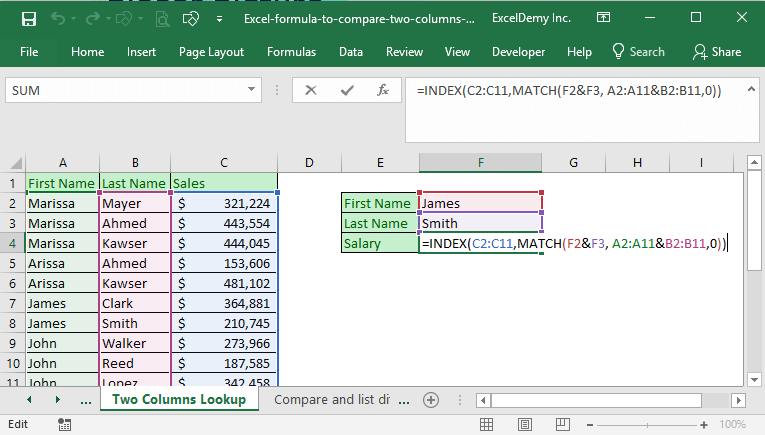 You might also want to compare two columns row by row like the following image. This is a straightforward Excel IF function. 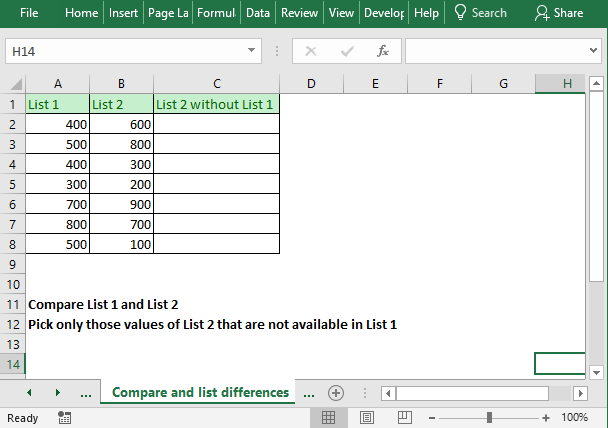 If the cells A2 and B2 are same, “Matched” value will show in cell C2 and if the cells A2 and B2 are not same, then “Not Matched” value will show as the output. This comparison is case-insensitive. “Milk” and “milk” are treated as same in this comparison. You see now “Milk” and “milk” are treated differently. They are not same. Here is the syntax of the EXACT function. It takes two text values as arguments, if they are case sensitively exact, the function returns the TRUE value, otherwise, the function returns the FALSE value. 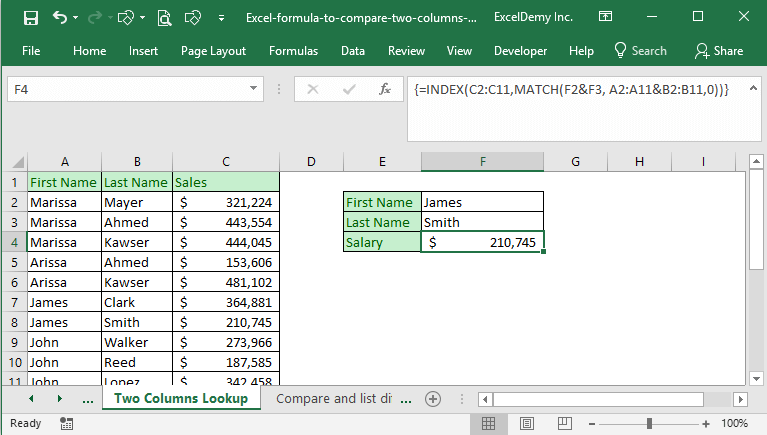 So, these are my ways of comparing two columns in Excel and return a value based on the comparison. Do you know any other better techniques? Let me know in the comment box. I am eager to update this article. Thank you very much. First of all, sorry for my bad english, than i want to congrats you for this lection and you have made in me one of the fan of your blog. Very clearly explained. This was a great help! Thanks a lot, I liked your lesson, and liked your way of explaining (how does this formula work?) I like it so much. Thanks again.